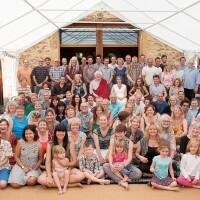 Lama Jampa Thaye has been staying at Sakya Changlochen Ling, Dechen’s European retreat centre, since late July. During the first week of the summer course Lama Jampa taught part 1 of Sonam Tsemo’s ‘General Presentation of the Tantra Sets’, a clear and helpful description of vajrayana and its context. There was a large and enthusiastic audience from the UK, continental Europe and the US.